Thank you for expressing interest in our Gateway to Amish Country! We invite you to visit Northern Indiana’s beautiful farms, green grassland meadows, and beautiful flowing rivers. Watch the horse and buggies go by or maybe even take a ride in one! 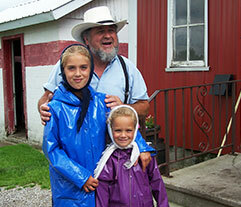 We want to show you ourAmish/Mennonite community. While you are traveling, you will hear many stories of Amish/Mennonite heritage, and you will have a chance to ask questions along with the chance to experience some hands-on activities. We also have a step on Amish Tour Guide that would love to join you on the coach, speaking English along with Pennsylvania Dutch, their first language. You could even enjoy a delicious Thrasher’s dinner at one of our wonderful Amish homes! Join us for days of relaxation while possibly also enjoying an Amish farm, buggy shop, RV factory, quilt shops, rug weaving, or furniture shop tours. Shipshewana also offers many novelty shops to explore. If you would like us to plan your itinerary, please give us a call. We would be glad to help and have over 25 years experience in touring and planning special events. There are so many unique things to see in the heart of “beautiful Northern Indiana Amish Country.” There is nothing that would please us more than to share these beautiful sights with you. We have one, two, and three day itineraries that can help you plan anything you would like. Please feel free to call if you need any suggestions or have any questions. We will work with you to build the best itinerary at the best price possible. We are confident that you will be pleased with our services. Contact us today for rates and availability!